The Countdown Clocks to the Big Game are winding down. The temperature in New York City has bottomed out and is starting to head back up. Broadway has been turned into “Super Bowl Boulevard” and there is even a 60 foot high by 180 foot long “Toboggan Run” that can be ridden for $5 a ride. Yes, the Big Game is almost upon us so that means it’s time to start finalizing your Game Day Menus. 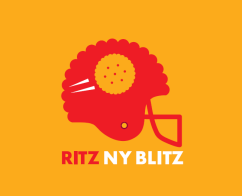 So why not consider some of the incredible #RITZNYBlitz recipes available within the RITZ Recipe Collection at Allrecipes.com that were conceived & developed by my fellow Allrecipes All Stars and a few of New York City’s most iconic restaurants? I know I plan on making more than a few of them myself. It’s going to be an exciting game so why not add some excitement to your Game Day spread. I know it’s been fun for me to help create & promote these recipes and I hope it will be fun for you to make & eat them too. I participated in a campaign on behalf of RITZ Crackers. I received a sample to facilitate my review as well as a promotional item as a thank-you for participating. compensated for my work with Allrecipes.com. on BEHIND THE SHADES. The reviews, content and opinions expressed in this blog are purely the sole opinions of Doug Matthews. Follow The Recipe ? Who ? Me ? I remember a surprise quiz that my 5th grade math teacher, Mrs. Conroy, gave our class one spring morning. When she handed out the two sided quiz she made sure to tell us in her two pack a day raspy voice to read the all of the problems on the whole quiz before we started our work. Yeah, yeah, yeah I said to myself. I was in a competition (in my own mind) with a girl in class for the unofficial title of “Fastest Mathlete in 5thGrade” and I wasn’t going to let something like reading the problems ahead of time slow me down. When Mrs. Conroy croaked out “Begin” I tore into the problems like a swarm of hungry grasshoppers in a new field or your co-workers at the annual holiday office potluck lunch. I was on question #4 when I heard someone behind me who definitely was not in the competition for the “Fastest Mathlete in 5th Grade” say “Done” followed immediately by two others who weren’t exactly “A” students either saying the same thing. “How could this be ?”, I said to myself as I glanced around and took in the chirping chorus of “Dones” accompanied by the clicking of their pencils being placed on their laminate desktops. I desperately started reading the test to see what I had missed. When I got to Question #20 I read with horror – Now that you have followed my directions, flip your paper over. Do not do any of the problems. Put your pencil down and say “Done”. It was then that I realized that the whole class was looking at me. I was the only one who wasn’t “Done” yet. This story was kind of a roundabout way of my saying that I have never been very good at following directions and that especially applies when we start to talk about the kitchen. I have a confession to make. I am terrible at following recipes, even my own recipes. I’m always tinkering with those. I don’t think there is anything that I have ever made exactly the same way twice. Not exactly what you expect to hear on a recipe website, especially a recipe website such as this one where I have more than a few published recipes. It’s not that I think I know better than the person who came up with the recipe, I don’t. The recipe was developed with their likes & dislikes in mind, not mine. It’s just that most of the time I either don’t have one of the ingredients the recipe calls for and I have to substitute or there is an ingredient that I just know I don’t like so I switch it out for something else in my pantry or fridge. So it is actually rare that I follow a recipe ingredient by ingredient or measure by measure from start to finish. That is until now. Recently as an Allrecipes Brand Ambassador I have had to follow recipes exactly and that has been a real struggle for me. Kind of like the struggle I had with putting on a tie and going to Sunday School as a kid which may have been the reason (Who am I kidding ? It was the reason.) I made the traveling 11-12 year old allstar hockey team as a 9 year old but that is another blog for another time on a another forum. Suffice to say, I even change my Grandmother’s recipe for Apple Delight and she got that recipe from her Grandmother who know doubt got it from her Grandmother too so following recipes by complete strangers or spice adverse middle of the tastebud road companies just isn’t going to happen while I am manning the burners. I know I am not alone with this affliction because for years both here in the Blogs and over on the Buzz (Recipe Exchange for you oldtimers out there that haven’t gotten sick of my ramblings yet) there have been countless blogs & postings lamenting the reviews that people get & give for dishes that were made in their own way and not in the intended manner yet are reviewed as being done in the same manner as the original recipe. I can’t help but shake my head at those misguided missives & their complainers and move on. Like snowflakes & fingerprints, everyone’s tastebuds are different and opinions are like *expletive deleted* and everyone has one. I guess what I am ultimately trying to say is, have fun with your food. Make the recipes your own. Don’t blame the recipe if it isn’t good, you never have to make something exactly the way it is written and whether it is good or bad doesn’t make it right or wrong. To me, Walk/Don’t Walk signs & crosswalks in New York City are merely suggestions while to many others, they are the law. To me, Julia Child & her culinary descendants are merely Crossing Guards there to help you across the culinary divide. So go enjoy yourself in the kitchen and don’t worry, there really is no such thing as the Kitchen Police. You really can get wild & crazy and add bacon if you want.